The Council Cabinet announced plans on 27 November 2008 to make cuts in libraries and leisure centres including the closure of Hoylake Library. Steve Maddox (Wirral Council's Chief Executive) described how the October 10th Cabinet meeting had agreed on a small number of multi-use centres. Three options had been considered: (1) a no-change option that was "not possible", (2) a minimal change option, and (3) concentration of services in multi-use centres, which was the option selected. The choices being made will be for the coming 10, 15, 20 years. It was announced that public consultation would be starting immediately for a six-week period, but it was not clear what the consultation would be about, as background information had not been supplied and the choices were not explained. A Special Area Forum for West Wirral (Hoylake and Meols, West Kirby and Thurstaston), Greasby, Frankby, Irby, Upton and Woodchurch was held on Wednesday 7th January 2009 at West Kirby Concourse. There was much opposition to the cuts. 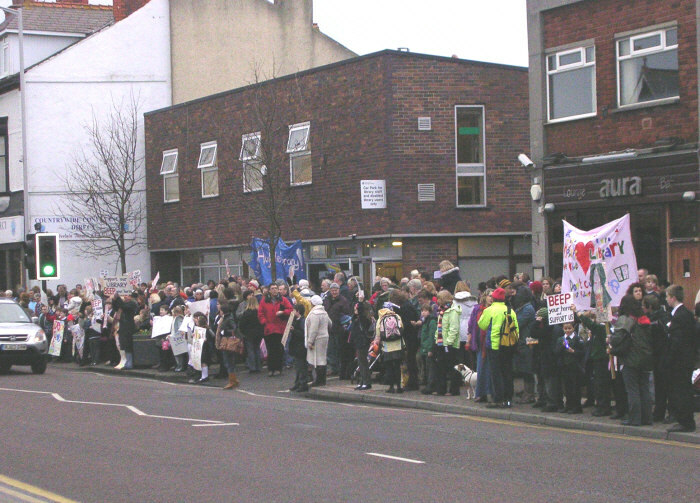 The Cabinet made a further decision on Thu 15th Jan 2009 confirming many of the cuts, including closure of Hoylake Library. The Wirral library closures were suspended by the Government on 3rd April 2009 - see http://news.bbc.co.uk/1/hi/england/merseyside/7982435.stm - and an Inquiry by Sue Charteris was held at the Floral Pavilion on 9th and 10th June. A decision is not expected until the end of July at the earliest. At the West Wirral Area Forum of 17 June, Council Officers admitted that a full Disability Impact Assessment had not been done concerning the library closures. The Libraries Inquiry Report by Sue Charteris was published November 30 2009, and is available here. The Report is 98 pages long, but there is a 6-page Executive Summary (pages i to vi) at the start. "it is not possible for the Inquiry to endorse Wirral MBCs current plans for restructuring its Library Service". The statement by the Minister Margaret Hodge (closing the Inquiry) is available at http://www.culture.gov.uk/reference_library/media_releases/6489.aspx . The closure plans were dropped by the Council. • "We the undersigned petition the Prime Minister to stop Wirral Borough Council from closing the borough's libraries, sports centres, community centres, and Pacific Roads Arts Centre"
Go to http://petitions.number10.gov.uk/WirralCulture/ to add your name. • "We the undersigned petition the Prime Minister to Save our libraries and leisure centres on the Wirral." Go to http://petitions.number10.gov.uk/SaveWirralsPools/ to add your name.